The smartphone has become an essential part of our daily life. Some use it for socializing, and entertainment purpose but people like me use it as a productive device. Apple produces premium gadgets, and they are pretty cool in terms of quality and performance. iPhone, iPad and iPod touch use Apple’s own mobile operating system iOS to provide a buttery smooth experience. But sometimes we trapped in some typical issues like managing, transferring files without being caught up in iTunes limitations. Though there are some critical ways to do the same thing that iTunes does, but they are not relevant for all kind of users. iTunes does a perfect job of helping you manage your iOS device from a Mac or Windows computer. Besides this, it helps you to do daily backups of your iPhone or iPad’s data and can update or restore the iOS. But, when it comes to optimizing your phone or tablet, it fails. Tenorshare iCareFone formerly known as iPhone Care Pro a fantastic utility tool, available for both Mac and Windows systems to manage, clean, optimize, speed up and secure your iOS device. You need at least 1GB RAM and 200MB free disk space to run this software. It supports on all latest Operating Systems including Windows 10 and Mac OS X 10.11. Almost all iPhones, iPads and iPod Touch devices having iOS 9.3 and lower perform pretty well with iCareFone. Let’s have an in-depth visit of Tenorshare iCareFone, an easy and advanced way to manage, optimize and repair your iOS device. It comes with six powerful iOS management tools. Let’s have a look at details. Tenorshare iCareFone is a perfect file management tool for your iPhone, iPad and iPod Touch devices. 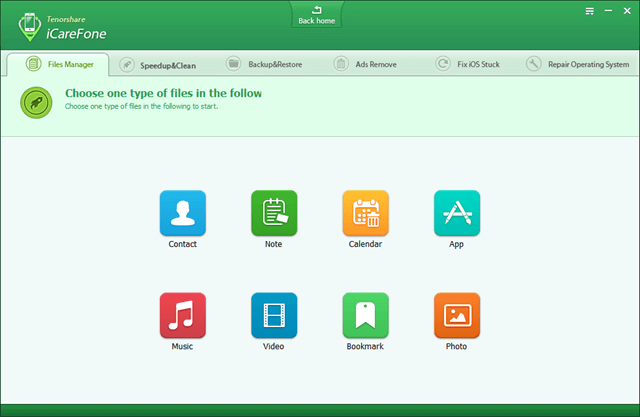 This tool consists of eight types of file managers, such as Contact, Bookmark, Calendar, Note, Video, Music, Photo, and App. You can easily transfer media files to your iOS device and also can export the exits files to your computer. 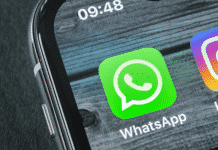 It allows you to merge duplicate contacts directly on your computer to iOS. The App Manager shows all user installed apps, which you can do a backup or directly delete without any effort. Every application creates unwanted junk files which cause system slow. 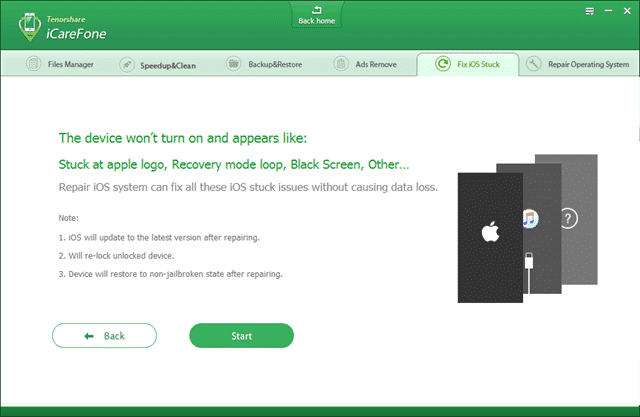 iCareFone advanced SystemCare for iOS remove these junk files temporary files, app cookies, app crash logs, photo caches, call history, iTunes Radio caches, etc. There are two different modes available for cleaning: Quick Clean and Deep Clean. Quick Clean is the fastest way to remove junk files whether Deep Clean takes much time to scan and remove the unwanted files. It has more options to select. In some cases, it can clean up to 60% space and 10X faster after the cleanup. iTunes is enough to backup and restores iOS data, the why should you use Tenorshare iCareFone? Sometimes, iTunes can’t recognize your iDevice due to some technical issue. But, iCareFone do this job efficiently and faster than iTunes. To save space on your computer, it deletes unneeded backups. You can easily create a complete backup and restore the data in one click. 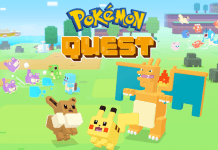 Most of the free apps and games have ads. These ads are very annoying while playing a game or checking an app. iCareFone is a great iOS ads blocker tool which can block any type of ads like floating ads, pop-up ads, full-screen ads, Google AdSense, etc. from any of the apps on your iPhone, iPad or iPod Touch. You can remove ads from apps and games in the iOS device in a bundle or one by one. It only removes the ads, but doesn’t harm to your apps, and there is no leaking of personal information. Sometimes, jailbroken as well as normal iOS devices get stuck and can’t boot properly. It can help you set all of the iOS stuck issues on iOS Recovery mode, DFU mode, Apple logo, iOS freeze, black screen, reboot loop, etc. only with one click. After repairing, iOS will update to the latest version; it’ll re-lock the unlocked device and restore to the non-jailbroken state. If you iOS system is damaged severely, then iCareFone can help you to download the latest firmware to fix up the iOS crash, upgrade failure, iOS stuck and other issues without any data loss and jailbreak. You can import the firmware manually from your computer or can download it automatically from the server. It provides an easy way to download firmware to repair iOS operating system. Tenorshare iCareFone is an all-in-one must have and a quite useful tool for iPhone, iPad, and iPod Touch users. All of the features mentioned above are very helpful for both new and professional users. It works pretty well concerning optimizing and fixing an iOS device.